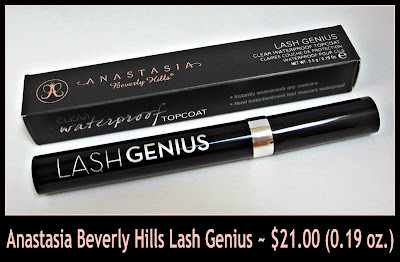 Anastasia Beverly Hills has introduced Lash Genius, a product that is a clear topcoat that instantly waterproofs, refreshes, and protects any mascara all day, without drying or clumping. To be honest, I've never thought "Hmm, someone should invent a product that waterproofs my mascara." I just buy waterproof mascara if I remember to look at the packaging for the word waterproof. Or I buy mascara that isn't available in a waterproof formula, and suffer through the consequences because I like everything else about it. So even though I never gave any thought to the possibility that a product like this could exist, I'm certainly glad it does! 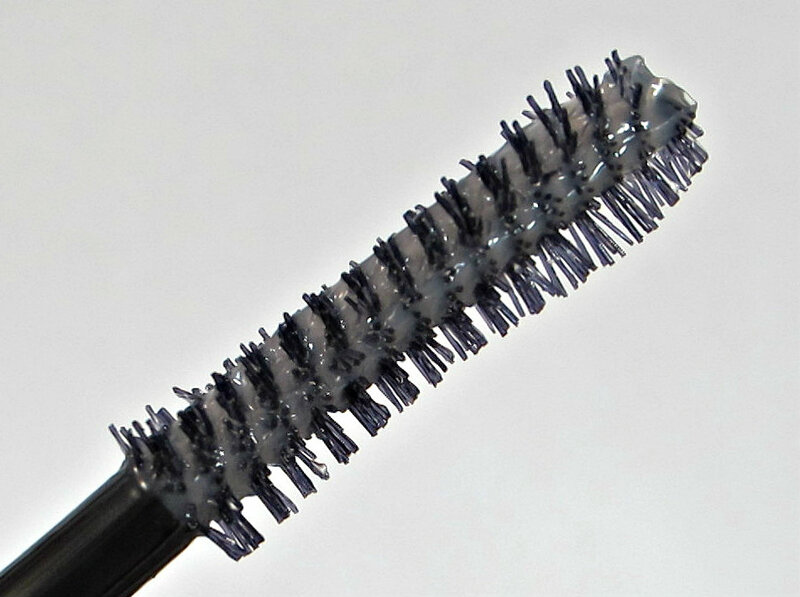 Lash Genius comes in a typical mascara-type tube, and the bristles are short and stiff. The formula is a slightly milky colored gel that doesn't feel tacky between my fingers, but it does begin to tack up slightly after about a minute. This product is fragrance, paraben, and cruelty free. Not only does it make your mascara absolutely waterproof, it also freshens and renews your mascara. I like my mascara to look glossy, so if I'm wearing a particular mascara that doesn't typically have a noticeably glossy finish, Lash Genius does a wonderful job of adding some shine and gloss to it. My go-to mascara is Diorshow Waterproof Mascara, but that doesn't mean I don't buy other brands. You might think I'm a hoarder if I ever showed you my mascara stash! There are two things that I want from a mascara in addition to lengthening and thickening: glossiness and softness. Lash Genius has me using mascaras that didn't give me those qualities when I first used them. Some mascaras may work really well for me, but that "crunchy" feeling they impart on my lashes makes me crazy! Certain mascaras look and feel wonderful to me, but they aren't very glossy looking. Lash Genius to the rescue! Have you ever tried to freshen up your lashes after a long day, only to end up with clumps and flakes because you applied fresh mascara over 12-hour old mascara? I find that Lash Genius brightens, refreshes, and intensifies my mascara without that worry. Above are the ingredients and additional information from the packaging, and below is a useful video from Anastasia Beverly Hills describing Lash Genius in more detail. This is a very useful product, although I didn't necessarily see all of the possibilities when I first heard about it. In addition to everything it can do for my mascaras, this multitasker can also be used as a clear brow gel. It can safely be used on false eyelashes too. And on those rare lazy days when I opt for no mascara, just a quick hit with the lash curler and a swipe of Lash Genius gives my lashes a glossy look that holds the curl in place. Lash Genius is available at Anastatsia Beverly Hills, Sephora, and other retailers. This product retails for $21.00. I would have thought "I don't have any need", but the idea of using it to freshen mascara without redoing eyes completely is appealing. Thanks for sharing. i really want to try this but wasn't sure it would work all that well. good review, maybe i'll take the plunge! I LOVE this stuff! Anastasia has completely impressed me.